What music at a party? Just the word immediately evokes an image of a thousand and one nights, of a veiled dancer who on (Oriental) Music slowly and gracefully one by one or decreases her veils. Striptease avant la lettre. The real origin of the dance remains veiled. There are hardly any written sources (known). We try to explain and lift a tip of the veil. An original veil dance would have been a mystic temple dance based on a Babylonian story of Ishta about birth and rebirth. According to Homer, the Greek goddess Hera, Aphrodite, the goddess of love lends an embroidered belt that she wear with her tassel belt to seduce her husband Zeus. And successfully. Venus would sometimes have been veiled. And her priestess or heptástolos apparently surrounds himself with seven (hepta) clothing layers (stolos). A "veil dance' appears in the play Salome that Oscar Wilde wrote in 1891. Salome (Hebrew: rich of peace) is the not mentioned by name in the Bible story Mark 6:14-29 (Matt. 14:6) daughter of Herod Philip and Herodias. Tetrarch Herod Antipas asks his 15 -year-old stepdaughter Salome to dance for him at a party. In return, she may ask him whatever she wants. She agrees to do the dance of the seven veils " and requires (also at the request of her mother Herodias) the head of John the Baptist. The French painter Gustave Moreau was the first to displayed the 'dance of the seven veils". He was obsessed by the figure of Salome. He made a hundred portraits of her. The most discussed striptease in world history is also a well-known and recent veil dance. 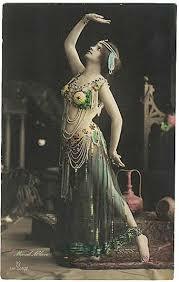 Mata Hari (Malay for Eye of the dawn, sun. Real name: Margaretha Zelle Geertuida) was born in 1876 in Leeuwarden (Netherlands)and became an exotic dancer and spy in the service of the Germans (and the French?). Her artistic striptease from 1905 made ​​her famous and rich. During the First World War, she was found guilty of espionage against the French state and therefore executed on October 15, 1917. Her imaginative life was filmed at least 12 times, and even more topics are found in literature. The mysterious dance of the ‘seven veils’ remains a veiled and imaginative mystery. The concept of 'seven veils' is often used, and afterwards filled in from mysticism or religion. For example, in the form of inhibitions to recognize, or to find back values ​​of innocence, pride.. In our culture, the (white) veil only (sometimes) is still used today at a wedding. There are three possible reasons for this. When brides werekidnapped by an enemy tribe they were obscured during the flight with a cloth which was only removed immediately before the ceremony. Whether the bride wore a veil to be less recognizable to the evil spirits. The veil stayed there until she was in the church. The veil is a sign of inferiority to men. If the bride let her husband remove the veil, then she gave thereby that she was appropriate to its dominance. If she took him herself off, then she showed her independence.